Ohme clear glaze porcelains were produced for sale in Europe, as well as the United States. Numerous undecorated pieces were also sold in the United States for hand decorating, a popular activity in the early twentieth century. 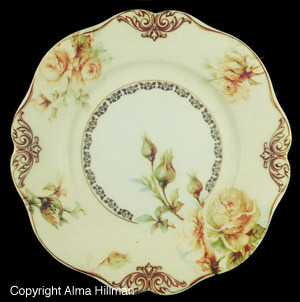 Some were purchased by commercial decorating firms such as Pickard, and numerous souvenir plates were produced for sale here and in Europe. Major ports of entry for Ohme China into the US were Portland, Maine, Boston, Mass., and New Orleans, Lousiana. 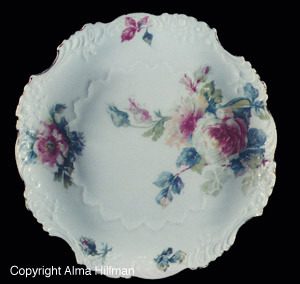 The Old Ivory china was originally marketed in the retail outlets as affordable fine china and elegant dinnerware. Later on it was utilized as free promotional gifts. There is little documentary information that has been found on the Ohme Porcelain Manufactory. Most of what is known about these porcelains has been derived from the surviving porcelains themselves, particularly the blanks and patterns that were produced by the factory. The Society has an ongoing research program to catalog the blanks and patterns that were made by the Ohme factory, as well as a search for documentary materials, such as newspaper and magazine advertisements, and trade catalogs. The Society would appreciate hearing about any such information that might be available. Please Contact Us if you can help our research efforts. by Alma Hillman, David Goldschmitt, and Adam Szynkiewicz. by Alma Hillman, David Goldschmitt and Adam Szynkiewicz. Published by Collector Books, Paducah, Kentucky. Published by M. Liehners Hofbuchdruckerei GmbH & Co., Sigmaringen, Germany.